I am so happy to introduce today’s guest. I’ve worked with Rachel Brimble at The Wild Rose Press on a few books, and she was one of my early authors when the company first opened. I love her writing…and she’s a wonderful person! Welcome, Rachel. Please tell us a little about yourself, where are you from? Where do you live now? Family? Pets? Hi, it’s so great to be here! I have been happily married to my husband (Mr B) for twenty years and we live near the famous city of Bath, England along with our two teenage daughters and mad chocolate Labrador, Tyler. When I’m not writing, I like to read, knit, walk the beautiful English countryside and watch far too much TV. Where did you get the idea for The Mistress Of Pennington’s? I absolutely loved the TV series Mr Selfridge and The Paradise, but as I was watching something was always missing for me. I came to realise that I wanted more depth to the struggles women were facing during the Edwardian era. All too soon I concluded that I would write a series books with ‘female empowerment’ as the theme. Thankfully, my editor at Aria Fiction loved this book enough to offer me a four-book contract. The Mistress of Pennington’s covers the issue of women in business, book 2 (coming early 2019) will cover women’s suffrage. I’m so excited! Why did you choose this genre (is it something you’ve written in before)? I’ve previously written historical romance set in the Victorian period and was ready to learn, research and write about a different era. The Edwardian period was a time of huge change for women and I couldn’t wait to start my research. When these books are done, I am very tempted to start exploring the Georgian period. For me, the most difficult thing is the plotting – it’s all very well to come up with a great book idea, but is it strong enough to stretch to 90,000 words? I usually struggle around the 40,000 word mark but heed my own advice and write through it. A first draft can be edited, a blank page…not so much! Gone With The Wind by Margaret Mitchell or The Outlander series by Diana Galbaldon – I love to think that one day I’ll write a huge epic of a book or series. To have so much space to really explore issues of the time as well as digging deep into lead and secondary characters appeals to me on every level. What’s the main thing that you could get rid of in your life that would give you more writing time? What do you want readers to come away with after they read The Mistress of Pennington’s? To feel inspired, transported back in time and looking forward to book 2! The ultimate aim of this series is to remind us all how much women have struggled for the freedoms that we have today and how they manage to find love and have families along the way. The Mistress of Pennington’s is a book of hope, love and never giving up. What actors would you like in the main roles if your book were made into a movie? This is an easy question for me as I’m a very visual writer and start each book trawling the internet for pictures of my hero, heroine and villain (if I have one). So, for The Mistress of Pennington’s, I would love Niamh Walsh to play Elizabeth Pennington and Josh Lucas to play Joseph Carter. I love reading crime fiction so would definitely like to try to write the genre at some point in the future. I think I’d probably go historical and set it in the Georgian or Victorian period, both for atmosphere and the fact they didn’t have as much complicated forensic procedures back then! They are all very supportive and respect that writing is my passion and always will be – a few of them are amazed I’ve written 23 books to date and have written around my children since they were 4 & 6 years old. Suffice to say, my writing time is a lot more my own now they are almost 19 & 17! Which do you prefer: Board games/card games or television? TV…closely followed by board games! The Mistress of Pennington’s is available to buy now! 1910 – A compelling tale of female empowerment in Bath’s leading department store. Perfect for the fans of the TV series Mr Selfridge and The Paradise. Elizabeth Pennington should be the rightful heir of Bath’s premier department store through her enterprising schemes and dogged hard work. Her father, Edward Pennington, believes his daughter lacks the business acumen to run his empire and is resolute a man will succeed him. Determined to break from her father’s iron-clad hold and prove she is worthy of inheriting the store, Elizabeth forms an unlikely alliance with ambitious and charismatic master glove-maker Joseph Carter. United they forge forward to bring Pennington’s into a new decade, embracing woman’s equality and progression whilst trying not to mix business and pleasure. Can this dream team thwart Edward Pennington’s plans for the store? Or will Edward prove himself an unshakeable force who will ultimately ruin both Elizabeth and Joseph? Rachel has had several novels published by small US presses, eight books published by Harlequin Superromance (Templeton Cove Stories) and four Victorian romances with eKensington/Lyrical. In January 2018, she signed a four-book deal with Aria Fiction for a brand new Edwardian series set in Bath’s finest department store. The first book, The Mistress of Pennington’s released July 2018. Rachel is a member of the Romantic Novelists Association and Romance Writers of America and was selected to mentor the Superromance finalist of So You Think You Can Write 2014 contest. When she isn’t writing, you’ll find Rachel with her head in a book or walking the beautiful English countryside with her family. Her dream place to live is Bourton-on-the-Water in South West England. She likes nothing more than connecting and chatting with her readers and fellow romance writers. Rachel would love to hear from you! As everyone in the free world and beyond knows, today would have been Elvis Presley’s 80th birthday. He was born January 8, 1935 in Tupelo, Mississippi. He’s been gone for 38 years, but his legacy is thriving. Never has another entertainer had such a profound and lasting impact on the world. I often wonder, what would Elvis be like today had he lived? His hairdresser, friend, and mentor, Larry Geller, stated that, in the months preceding his death, Elvis spoke of turning his life around. He wanted to get healthy, he wanted to rid his life of some of the people around him who weren’t good for him, and among other things, he wanted to focus on making serious movies. I fervently wish he’d had that opportunity. While I would not have wanted him to stop touring (and I don’t believe he could have done so completely, he loved it too much), I would have loved to see what kind of new chapter he could have begun. I have loved Elvis my entire life. He’s as much a part of me as breathing. I saw him in concert three times, I own all of his movies on DVD, my car stereo permanently remains on Sirius XM Elvis Radio, I named my son Presley, and my first ever romance, which I wrote at age eleven, was titled ‘Just Pretend,’ and my hero, who looked like Elvis, was named Lonnie Beal (after Elvis’ character in Tickle Me :)). 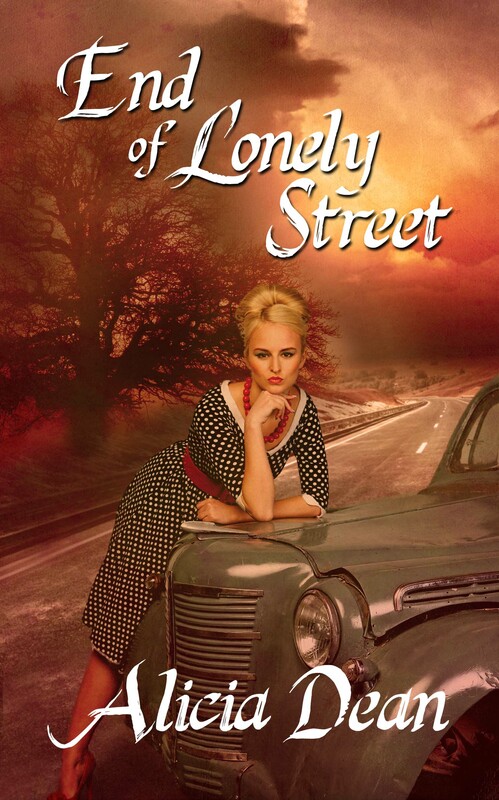 Today, in honor of Elvis’ 80th birthday, I am pleased to announce the release of ‘End of Lonely Street’, a Vintage Romance Short Story set in 1957, in the era when Elvis first burst on the scene. I have over twenty published titles, and I mention Elvis in almost every one of them, but this story is even more Elvis-oriented. It was so much fun to write it, and I hope it’s as much fun to read. First place winner has first choice, second place winner has second choice, third place winner receives remaining prize. Can she let go of the past, before it destroys her future? All Toby Lawson wanted was to go to college to pursue her dream of becoming a teacher and to be free of her alcoholic mother and the painful memories of finding her and the guy Toby loved kissing. But when her mother nearly burns the house down, Toby must put her dreams on hold and return home to care for her. The only time she isn’t lonely and miserable is when she’s listening to her heartthrob, Elvis Presley. His music takes her away, helps her escape from everything wrong in her life. Noah Rivers has always loved Toby, but no matter what he says, and even though she knows her mother initiated the kiss, and that he didn’t kiss her back, she can‘t seem to get past what happened. He soon realizes that the true problem lies in Toby’s belief that she’s not good enough for him and in her fear that she will be just like her mother. After work that night, Toby wasn’t ready to go home, so she sat in her car in the parking lot of Winstead’s, listening to the radio. “Love Me” by Elvis came on, and she cranked the volume. Nothing else calmed her and lightened her heart like listening to him. She could escape into his music and all the bad just…faded away. When Elvis sang, there was no drunken mother, no failed dreams, no dying Miss Murdock. Toby didn’t only listen to his music, she felt it. It seemed to vibrate through her blood. Although she was embarrassed to admit it, sometimes listening to him, watching him on television, made her all squirmy and hot—just like Noah made her feel. Especially that one night, when they had almost gone all the way. Toby had been a senior in high school, and he’d graduated the year before. He picked her up and they drove out to the bluff, known as Make Out Row, overlooking downtown Mapleton. A tapping sound on the window made her jump. She looked through the glass to find Noah standing outside the car. Was he real, or just part of the fantasy world she’d drifted to? When another tap came, she blinked away the memories. He was definitely real. I’m sure by now, most everyone has heard of The Million Dollar Quartet, if only because of the theater production (Which is coming to Oklahoma City and, while I’m not into theater, I plan to attend). 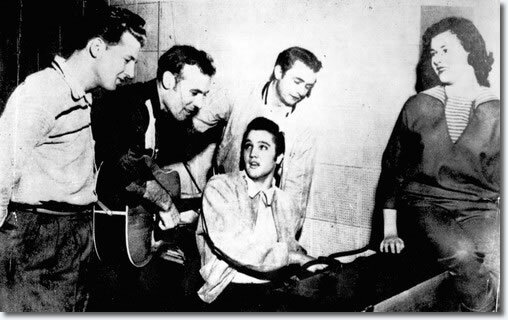 In case you are not familiar, on December 4, 1956, four up and coming singers, Elvis Presley, Carl Perkins, Johnny Cash, and Jerry Lee Lewis, ended up at Sun Records at the same time. Carl Perkins was somewhat successful because of Blue Suede Shoes, and Elvis had recently burst onto the music scene and was starting to see some success. But who could have predicted that all four of these entertainers would go on to become legendary? Elvis had already left Sun for RCA, but he dropped by to visit during a Carl Perkins recording session. An impromptu jam session ensued, and the engineer decided to record it. Sam Phillips called in a newspaper photographer, who snapped the now famous photo. Although, in reality, the original photo (below) is not the one that most people are familiar with. The woman in the picture is Marilyn Evans, a Las Vegas showgirl who was Elvis’ girlfriend at the time. She was cropped out of the photo, but you can hear her voice in some of the recordings. In the musical, she is represented as Dyanne who sings on some of the sessions, but Marilyn did not actually sing. Below are some songs from the session. Listening to it gives me chills. Hearing these young, phenomenally talented guys casually playing and singing together is an exceptional treat. I love that they mostly sang gospel songs. There was some speculation as to why Elvis and Jerry Lee were heard more predominantly on the gospel songs, and George Klein, Elvis’ lifelong friend said that Jerry Lee told him it was because Elvis and Jerry Lee were raised in Assembly of God and Carl and Johnny were Baptist boys, so they didn’t know all the words. The recordings were not released until twenty-five years later. Isn’t it incredible what has developed from that seemingly casual, innocuous event of four guys, who coincidentally wound up in the same place at the same time, just hanging out and doing what they love?